Actually, we almost didn’t go. Christina had had a hectic couple of days, and wasn’t feeling 100% when we got up on the Friday morning. 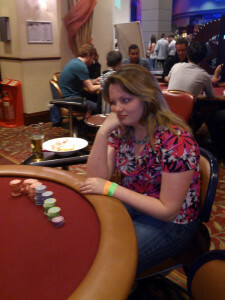 We’d rung the casino in Coventry, and were told the main student tournament, which Christina wanted to enter, was full up. However, it was likely she could still get a place on the reserve list, which meant she should still be able to get in, so with this in mind, we headed off just before midday. With just one stop at the Spar on the A40 (cheapest services around, with 35p energy drinks), we made pretty good time, and arrived at the Ricoh Arena at around 2pm. This was around an hour after the official start time of the tournament, but late entries were allowed, and Christina was quickly found a place. I wished her luck, and left her to it, while I went off to find a hotel. This didn’t take very long, as there was in fact a hotel right next to the casino, and also part of the Ricoh Arena. Rooms were £50, and as this was not too expensive, and saved the hassle of searching around for a b’n’b, which might only be perhaps £10 less, I made the quick decision of taking a room here. 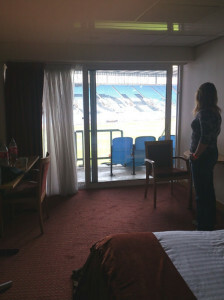 I entered the room, and had the shock of my life as the room overlooked the actual football pitch of the stadium itself! There were a couple of staff talking just outside of the room, so I went back out and jokingly asked if I would be allowed to play in the “garden.” Once he got my meaning, he said, no, if I tried it, I would be gunned down by security. “But surely if it’s not being used?” I joked. Now the man, who I guessed was some kind of manager, became more serious and said in fact, the stadium was being used more now – by Premiership clubs for training, etc – than when Coventry City actually played there (they can no longer afford the rent, which is unsurprising when you look at this place). As it turned out, the door/window that overlooked the stadium did not open more than a couple of inches, meaning you could not get out onto the pitch even if you wanted to, so the great view alone would have to suffice. Well, then I met up with Chrissy again at the casino. Unbelievably, she had been dealt aces in her very first hand, but sadly, had lost with them to someone with a straight, so had lost a lot of chips right at the beginning, and had already had to rebuy. I consoled her as we had a cigarette, and told her not to get too disheartened. Apparently, a huge number of people were taking the option of having one rebuy, so she was in good company. Chris saw the room I’d booked, and was as surprised as me on seeing the view. I think that cheered her up a little bit, at least. We had some of her home-made strawberry wine that she’d brought, and a bite to eat before back down again. Unfortunately, Chris was not to last too much longer in this tournament. These sorts of events, with huge numbers of entries, are always difficult, but of course, it’s always disappointing to go out, and Chrissy was inconsolable for a short time – she was very angry with herself, saying she wasn’t good enough, and why had she come here?.. Well, as we were here now, and had booked the room, we thought we might as well play in the casino’s regular Friday night tournament, which was to prove busy tonight, especially with all the students that were here. I actually thought the students might make things a bit easier, but this was not to be the case as we were both out relatively early. I think I’d played too many hands, and was trying to be a bit too cocky really, with a few bluffs that didn’t work out, and a couple of unnecessary hero calls. This was also a rebuy tournament however. By this stage, we had spent quite a bit of money, but in for a penny, in for a pound we thought, I guess, and after the first break, we were both back in it. I had A/K early on which, after about 3 callers, I shoved with, to take a reasonable pot in the early stages. A couple of hands on again though, I had Aces, which went all-in pre-flop against Kings, which hit a king on the flop, and I was out once again. Christina, on the other hand, was still in, and doing well. She always seems to do better after a break, and once the rebuy period has finished. In fact, she was doing very well indeed, and by the time it was down to around the last 20 (from a field of over 70), she was still in a strong position. With two tables left, she raised with A/9, and then was made to consider her move following a massive re-raise all-in. Chrissy made the call, the guy tabled K/Q off-suit, and Chrissy’s hand held up. Spectators were impressed, perhaps amazed by the call. The person she’d beaten had thought she couldn’t call, but she justified it afterwards by saying that this player had been consistently raising light, and it just so happened that she got it right this time as well. Chrissy took the chip lead to the final table of 10. There were to be 9 places paid, and it was not even agreed that 10th place should have a bubble prize, so it must have been pretty disappointing not going out in 10th. It got to around 5 places left, and Christina was out in front. She did make one suspect call, but was still doing ok. A couple more exits, and it was down to the last 3. I think I actually missed Chrissy’s exit hand, as I’d gone to the bar, but it turns out she was a little unlucky, going out with K/J versus 10/8. I think she could have considered splitting the pot with the other 2 still left in, but the third placed prize was still a respectable £270. We were no longer down for the day, and Chrissy had confounded nay-sayers once again with an impressive cash finish! By this time, it was gone 4am, and personally, I was pooped. Incredibly, Christina wanted to still play more cards, her 3rd place finish clearly not enough. Back she went to the casino to continue playing a cash game! Despite, as the BBC might say, “hardline” or “extreme” tiredness, I felt I couldn’t get to sleep, and I went down to see how she was getting on. I found her at a table, blindly carrying on. I joined the table, and won a couple of hands, then picked up aces. Chris was in with me, along with two others. An ace came on the flop, giving me a set, and as I was first to act, I put in a smallish bet. Chris raised, and the other 2 folded, so it was just the two of us in the hand together. This meant that we couldn’t win between us, and would lose some to the rake. Well, anyway, I just donked it all in on the turn, Chris called with a straight draw, and I took the last of her money! This, I hoped would finally be an incentive for her to stop (even though I did pay it back), but still she wanted to play, on a higher stakes table! This was too much for me, and I marched back stroppily next door to the hotel. Fortunately, she had a change of heart, and came back to join me. We managed to finally get a bit of rest, but as it was now around 6am, it seemed unlikely we would be up by the 12am kicking out time – we hadn’t bothered booking a second night due to Chrissy’s exit from the main student event (which would carry on to Sunday). We just about made it up by 1am, and were obliged to pay a small fee for being late.